December | 2008 | Yum Honey! Kinpira: Gobo root, carrots and fish cake stir fried with soy and mirin. When I was still a college student, one of my favorite dining hall dishes was baked ziti. Something about the mild tomato sauce and dense pasta, topped with cheese was just fantastic in the middle of the finals rush. Carbohydrates are good for the brain, and good for the soul too. 🙂 However the thought of so many pots and pans to wash, and lengthy oven time makes me disinclined to make my own baked ziti. This recipe for absorption pasta is just as tomato-y, cheese-y, takes requires only one pan and no oven time. I also love fresh vegetables in my pasta, but feel free to add your favorites, or remove the veggies you don’t like. 1. Saute ground beef, garlic, and onions in a large sauce pan with olive oil until the meat is cooked, and slightly browned. 2. Add tomatoes, tomato sauce, tomato paste, eggplant, mushrooms, bell pepper, spinach, water, all the spices and salt. Stir well and bring to a slow boil on medium heat. 3. Add pasta, stir well. Cover pan with a lid and lower the heat to a simmer. Cook for 10-15 minutes, or until the pasta is just tender (al dente). 4. Combine cottage cheese and shredded Parmesan together until smooth. 5. Uncover, and stir the pasta to make sure it isn’t sticking, then stir in the cheese mixture until well combined. 6. Cover, and cook for an additional 5 minutes on low heat until cheese is melted. Serves 6-8, topped with a little (or a lot :P) of shredded cheese. Baked potatoes and other tubers just sing out winter comfort food to me. Living in Japan has it’s perks since there are usually 4-5 different varieties of sweet potatoes at the grocery at any given time. My favorite is the purple skinned, golden yellow centered satsumaimo which has a very smooth texture and mellow sweet taste. I like them baked, just as they are, or turned into sweet potato fries, but I love them mashed. 2.Peel and cut into 1-2 inch pieces, place in a microwavable bowl with a cup of water, cover with plastic wrap and microwave for 8-12 minutes, or until the satsumaimo is tender and cooked. Drain water. 2. In a medium bowl, combine kuromitsu, heavy cream and salt together. 3. 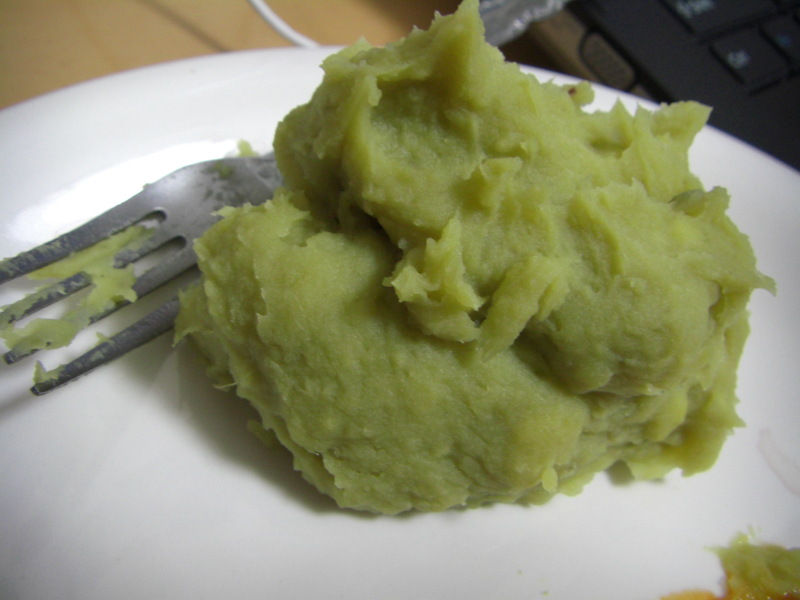 Add cooked satsumaimo, and mash with a fork or potato masher until fluffy. Serves 2-4, depending on the size of the satsumaimo. You may need to add more heavy cream or kuromitsu depending on the size of your satsumaimo.